Keydy Rico’s family is from Honduras. The 13-year-old plays for the Eliot School’s team. An hour before game time, the Emmons Harrigan O’Neill Memorial Rink in Charlestown was buzzing. Johnny Kelly was leaning over, tightening the skates of a girl who was born in a country where the only ice is what is placed in tourists’ cocktails. He wore a scally cap. She wore a smile. Everybody calls Johnny Kelly JK, and JK is a Townie. He is 63 years old and lives and breathes hockey, and lives to breathe hockey into every and any kid in Boston. Four years ago, JK and his band of hockey evangelists started a program for elementary school kids from the Charlestown housing projects. Dozens showed up on Sundays. Mike Harney, who runs the Play Ball! Foundation that gives middle school kids in the Boston Public Schools a chance to play sports, lives in Charlestown and heard about it. “So Mike goes, ‘Do you think you could do this for the city’s middle school kids?’ And I said, ‘You tell me where and when and we’ll be there,” JK said. Hockey isn’t a cheap sport, another obstacle for most city kids. Play Ball! pays for the equipment, the ice. This is back to the future stuff. Back in the day, schoolboy hockey was big in this city. But as the city’s demographics changed, and an increasing number of Boston public school kids came from places and cultures where hockey was unheard of or viewed as some exotic game best left to others, the high school teams faded from memory. There are only a handful of high school teams left in the city. But there are people like JK and Mike Harney and other folks who want all Boston kids to have a chance to skate, to sweat in the cold, to know what it feels like to stuff a rebound home or perform a perfect sweep check. And kids from all over the city are taking up the game. For every kid that comes from a country like Slovakia, where there’s a strong tradition of hockey, there’s nine who come from places where there is none: Mexico, Cape Verde, the Dominican Republic, Colombia, Morocco, Brazil. Half the players are girls. That would be Muhmood and Sahli Asim. Last year, the first year of the program, was really about getting these kids up on skates. Only a few had skated before. “Are you going to teach us how to stop?” a player asked. “That’s what the boards are for,” JK told him. The kids have to maintain a good grade point average to be eligible to play. “A carrot to dangle,” JK says. This year, the number of kids playing has doubled to nearly 100, and they wanted the scoreboards turned on. They’re playing games now, four nights a week. On Wednesday, it was ostensibly the girls’ teams from the Umana in East Boston versus the Eliot in the North End. But there aren’t enough girls from those schools to field a full team, so it was a mix of boys and girls. Briana Alexander, 11, from East Boston, pulled on the blue jersey for Umana. Mimi Pimental, 13 and from Dorchester, is from the Dominican. She got into the Metco program and hopes to go to high school in Wellesley or Lexington. She wants to keep playing hockey, too. The Eliot kids were pulling on their jerseys. 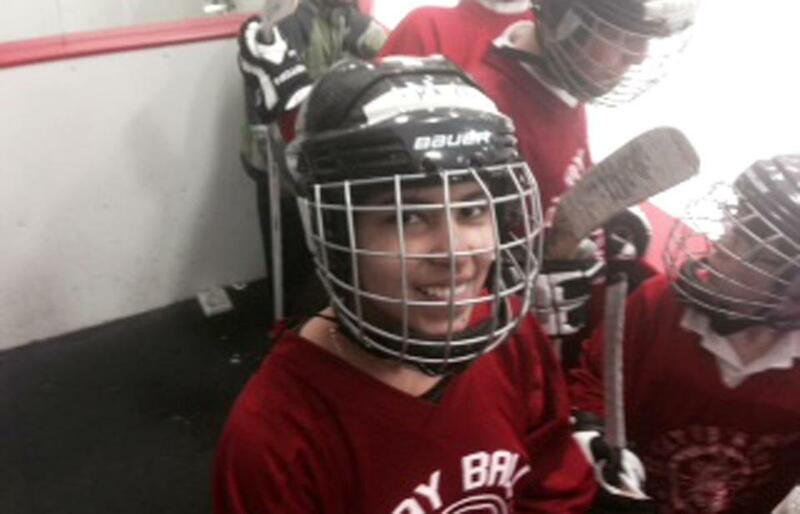 Last year, 13-year-old Vanessa Rico, whose family came here from Honduras and whom everybody calls Keydy, was the only girl from the Eliot playing hockey. “The other girls started playing because they knew how much fun I was having,” Keydy said. When it comes to hockey at the Eliot, a Honduran will lead the way. The other night, as the Umana and Eliot kids warmed up, Mary Balaconis, the Boston Latin School girls hockey coach, was in the stands, scouting. She chatted with Avery Esdaile, the Boston Public Schools athletic director. On the ice, JK had ditched his Charlestown Townies fleece for referee stripes. He dropped the puck, and they were off. The play was spirited. Whatever the kids lacked in skill, they made up for in effort. Being onside is, at this point, mostly an aspiration. But JK did call icing when passes went awry and the length of the ice. Brian Gonzalez, a gangly 14-year-old from the Eliot via Puerto Rico, potted the game’s first goal. Eliot had a little too much, prevailing 5-2 in a game that was closer than the score suggested. There were handshakes, and the equipment came off a lot faster than it went on. JK dreams, and he dreams big. He dreams of bringing back the old Boston City League, with teams from many of the city’s high schools. He played for Charlestown High back in the day, and he wants city kids, all city kids, to have that chance, that experience. “Every kid in Boston who wants to play hockey should be able to play hockey,” Johnny Kelly said. He sounded like a preacher, and he sounded like he was speaking the truth.